Is Gmail Secure for Business? Get Your Answer Here! Gmail is one of the biggest and widely used email services across the globe used by millions of users. It is a web-based service (can be accessed from anywhere) with all required facilities for an email application. But, the topmost concern of any user is the security and privacy of the data traveling between the users. No doubt, Gmail stores a large amount of data, a lot more than one can think like financial/ bank statements, legal documents, passwords, etc. Therefore, is Gmail secure for business is among the topmost queries searched by the users. Yes, Google has set various security measures to make sure that your information stored on Gmail is safe. But, everyone knows breaching can occur anytime and anywhere without any warning. Therefore, it is really important for users to make sure that their Gmail is safe and secure to use. Multiple Ways to Check- Is Gmail Secure for Business? #1: Is Gmail Secure From Hackers? The very first and major concern of users while using Gmail is that “Is Gmail safe from hackers?”. It is one of the commonly asked questions over the internet as the number of hackers are increasing day by day. Therefore, to make sure Gmail is secure or not, check it out for Phishing attack and Sniffing performed by the attackers. Phishing : It is a popular attack used by the hackers to steal data from your PC or get complete control over your system. They will send an email containing either a link or attachment, which looks like an authentic email. As you click on the link or attachment, the hacker will have complete access to your system. In such cases, Gmail offers multiple machine learning programs that works pretty well on spotting bad emails. Sniffing : Another popular way of hacking Gmail account is Sniffing. This will let them listen your web traffic. Your account is most vulnerable for the same if you are using public Wi-Fi like on airport or railway station. Now, to make your Gmail account secure from the same, it started forcing use of HTTPs for all websites. It simply stops hackers from tracking or listening your traffic on public Wi-Fi also. Tip: Always use HTTPS option must be enabled in your browser. #2: Is Gmail Safe with Strong Password? Another popular method used by hackers is guessing your password. They usually try all possible combination to crack your password. Therefore, if you have not used the strong password, then you might compromise your account. This is the reason, users are always suggested to set complex and multilingual password with special characters that hard to crack. Nowadays, Gmail has an application that can be installed and use on Android or iOS devices. Moreover, users mostly use Gmail account only to sync email account to phone. Sometimes, they use Gmail account as their default mail app. Although Gmail uses SSL encryption for the connection between mobile and account. This will prevent hackers from sniffing even on public Wi-Fi. But, a disaster can happen in any means. 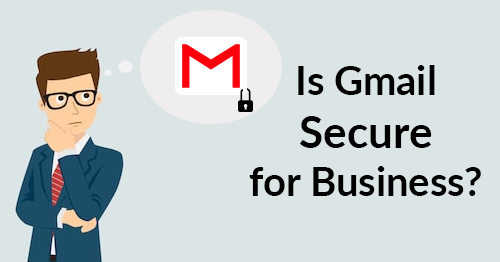 Thus, in order to be double sure about is Gmail secure for business or not, it is suggested to apply multiple security measures. As discussed above there are major security concerns that need to be taken care of. Therefore, how to make your Gmail more secure for business and from hackers is covered in this section of the blog. The very first step that one must follow is set a strong password. It can increase the security of your account and decrease the chances of hacking. Now, to for the same, you can try the combination of symbols, letters, or numbers. In addition, keep on changing your password frequently and try to avoid using personal information as your password. Do not forget to enabled two-step verification / two-factor authentication option. If this feature is enable in Gmail account, you need to enter a code sent to your registered mobile number whenever you want to sign in to your Gmail account. This way, if someone even hacks your account will not be able to access your mailbox as they do not have code or your phone. It is always suggested to maintain a checklist to have a safe Gmail account. It will let you verify all your security settings, recovery information, number of devices connected and assigned account permission to each. Yes, it might take some time but need to be reviewed multiple times in a year to ensure security of Gmail. Now, to be prepared for any mishappening, a user is suggested to save Gmail data locally also to keep business in running state always. Now, to do the same in a safe and secure way, a user is suggested to take help of a professional solution i.e., Gmail Backup tool. The software is designed to store Gmail for business account data on local machine in multiple file formats. Apart from all this, a user can download Gmail data in a customize way also by applying multiple filters. Gmail is used numerous users out there so, it needs to be secured always. However, various security measures are itself offered by Google that clearly is Gmail secure for business or not. Therefore, all major risks and their solutions related to Gmail account are covered in this blog above. One can have a look and ensure the security of their Gmail data.